The 21st of June this week saw global celebrations mark International Day of Yoga! 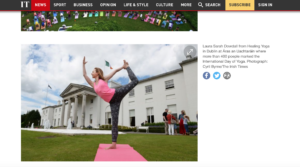 Healing Yoga was honoured to be invited to a Garden Party hosted by President Higgins and his wife Sabina in the beautiful grounds of Áras an Uachtaráin! The day was such a treat with a yoga practise on the lawn, a visit to the walled gardens, harp music, incredible singing, traditional Indian dance & a moving address by President Michael D.Higgins. It was a chance for a reunion with fellow Yoga Therapy Ireland friends and an opportunity to reflect on the sincere value Yoga brings to our lives. I learnt that the President’s wife, Sabina, has been a practising Yogi for many decades and had the joy of chatting with her during the shared yoga practice. To top it off, the Irish Times included a photo of myself in dancer pose with the backdrop of Áras an Uachtaráin which featured in an international collection of photos marking the worldwide celebration. A truly memorable occasion, sincere thanks to the President and his team for a wonderful day! Divine Feminine in FranceTry a Healing Yoga & Somatic Movement class taster – Book this week!